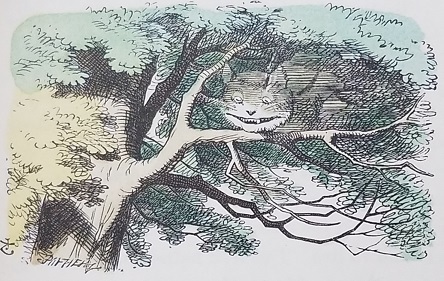 'Oh, you can't help that,' said the Cat: 'we're all mad here. I'm mad. You're mad.'" In Vermont the older people, especially those to the left of the Democratic Party, know that Bernie Sanders has actually been careful with the term Socialist in the past. When running in a then Republican leaning Vermont back in the 20th century he avoided that word when courting voters in rural areas. That is okay with me. Socialism is a tricky word. What bothers me about Bernard is that he pretends to have always been vocally for socialism, now that it suits his purposes. I am a Cheshire Cat socialist. I am usually okay with terms like New Deal Socialist, Social Democrat, and Democratic Socialist, though certain groups tend to treat those terms as their franchises, and I don't always agree with those groups. Green Socialist works too, as does libertarian socialist or anarcho-syndicalist. But with most people the word Socialist is so loaded I prefer to avoid it. I prefer to talk about specific policies and whether they are good for the world or not. There are also political organizations that may use the word socialist or communist that I do not want to be associated with in any way. The short list: Leninists, Stalinists, and Trotskyists. I reserve the right to decide how much government interference there should be on a case by case basis. In some cases I might want more interference, in come less. It depends on the specifics. I am against an aristocracy of wealth. Since one exists in the United States, I favor laws that would diminish it. That means I favor taxes on inheritances. I favor a progressive tax structure. I favor strong laws to protect the environment. I favor laws that encourage employee ownership of business, in particular of large corporations. I favor laws to make up for past injustices, including slavery. I favor taxes for public education. Way better public education. An ignorant public is the root of much of America's problems. But that is all New Deal socialism. What about the socialism favored by Socialists, government ownership of industry (including service industry, not just factories)? That is a really tricky question. From what I have studied, neither government nor private ownership of business guarantees that a business will be well run. Examples abound of badly run government businesses, and badly run private businesses. Badly run can apply to a number of scenarios: so badly run a company collapses. Wastefully run. Run in a way that hurts customers or workers. There is no magic bullet to prevent human greed, laziness, or stupidity. However, I think the concentration of power has proven to be dangerous. Having the Federal Government run industries does not seem like a good idea, in general, to me. I can see the government running certain industries when capitalists have screwed up too badly. Reality has proven that someone needs to keep an eye on business, lest it veer into organized crime. And ample provision needs to be made to allow citizens to keep an eye on government, lest it veer into organized crime or incompetence. I suppose to most right-of-center people my opinions sound like socialism. To my socialist friends it probably sounds like I have backed away from socialism. I am fine with that. I don't use a saw to hammer a nail, and I don't use a hammer to saw a piece of wood. I try to use the appropriate tool for each job. I plan the job, then I get to work. The free market is a nice tool, when it works. Corporations are nice tools, when they work. And government is a nice tool, when it works. My advice: observe reality first. Form conclusions. Make a plan. Be willing to alter that plan based on the feedback reality gives you.